I awoke today at 4am. We are on the way to Miami Airport where I will be dropping Denise off for her hoped for flight to Newark this morning; they are expecting 5-8 inches there…. Good luck Lady D. This post marks 69 days in a row with a new educational blog post, a record by far that should be extended for at least another week or so. Or not. 🙂 To show your appreciation, we ask that use our B&H and Amazon affiliate links for all of your B&H and Amazon purchases. Please check the availability of all photographic accessories in the BIRDS AS ART Online Store. We sell only what I use and depend on. We will not sell you junk. We know what you need to make creating great images easy and fun. And we are always glad to answer your gear questions via e-mail. Thanks and enjoy today’s blog post! This one took about 2 1/2 hours to assemble. I am feeling pretty good today. 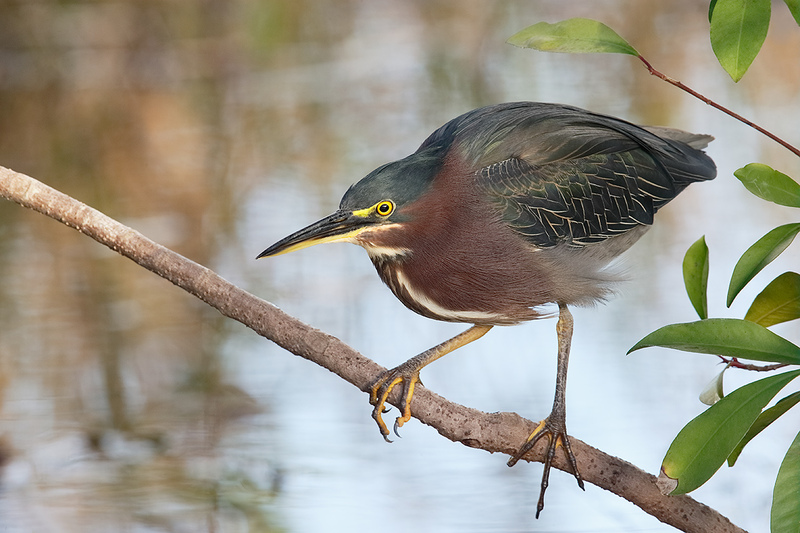 This Green Heron image was created on the Anhinga Trail IPT with the Gitzo 3532 LS carbon fiber tripod, the Mongoose M3.6 head, the Canon EF 600mm f/4L IS II USM lens, the Canon 2x EF Extender III (Teleconverter), and the Canon EOS-1D X Digital SLR camera. ISO 800. Evaluative metering +2/3 stop in soft sunlight: 1/80 sec. at f/11 in Manual mode. Green Heron is a notoriously hard to photograph species at Anhinga Trail. Though they are relatively tame and fairly common, they have a habit of choosing the most cluttered perches imaginable. To see them posing in gorgeous light but blocked by any number of twigs and branches is a pretty much daily frustration along Taylor Slough. We found this bird fishing just north of the spot where the boardwalk returns to the asphalt. It took me a while to choose a perspective that allowed a clean look at the subject. As I was working well off light angle I needed to wait for a cloud to cover the sun in order to create a pleasing image. The image presented here is un-cropped; the 24X magnification of the 600 II/2X III/1D X combo enabled me to isolate the subject nicely. Most of the images in the series had one or more leaves merging with the subject; this one did not. The bird posed so nicely that I encouraged many of the participants with shorter focal length lenses to put a card in my camera and make a few images. Many did just that. My position is that using the 2X TC with both f/4 and f/2.8 super-telephoto lenses adds range to your bird photography efforts with negligible loss of quality. All that folks need to do is to try it and practice as making sharp images with the doublers is an acquired skill. 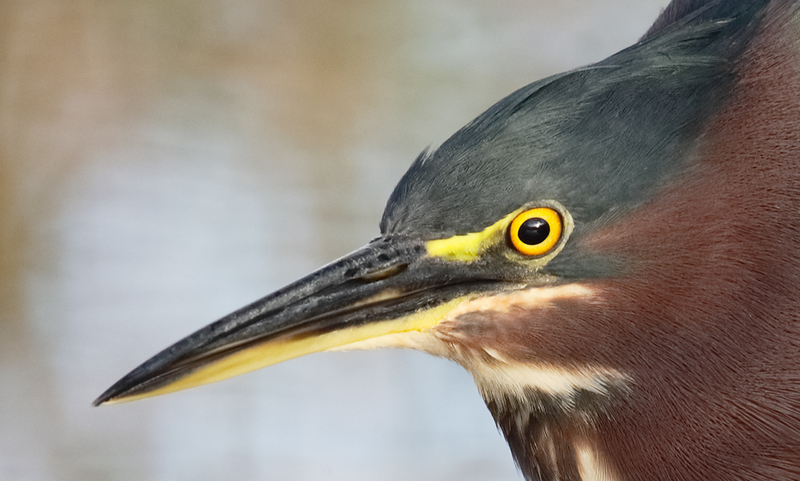 This is an unsharpened 100% crop of the Green Heron’s head. There are folks who state clearly that it is not possible to create a sharp image with a 1.4X teleconverter. There are others who state that 2X teleconverters are such garbage that nobody should ever own or use one. I doubt that any successful bird photographer uses their 2X TC as much as I use mine. On our recent Florida swing probably more than half of the thousands of images that I created were made with the 600 f/4 L IS II lens with the Extender 2X III in place. I am confident that I can make professionally sharp images on a consistent basis at shutter speeds as low as 1/60 sec. My success is due in part to the superb optics of all involved parties, to my nearly impeccable sharpness techniques, and to the great 4-stop Image Stabilization system of the new Series II Super-telephoto lenses. Not to mention stopping down from f/8 to f/11. The best way to learn my sharpness techniques is to join us for an IPT. Next best is to study the section on Advanced Sharpness Techniques in The Art of Bird Photography II (ABP II: 916 pages, 900+ images on CD only). Rereading that rear focus tutorial for the Nth time it finally clicked for me and I’m going to give it a try. One question about it though – how does this affect image stabilization/vibration reduction? Does it still activate when the focus button is held down? If so, would it be impossible to trigger the IS/VR when recomposing? Yes it still “works”. You don’t have to do anything!. I am an amateur and it works for me. It will work for you, believe me. When using the shutter button to focus you have to hold down the focus in order to turn on the IS/VR. I’m still not clear on whether that would work with setting focus and recomposing with a rear focus. My understanding is that the IS is independent of the focus. Try it to see. Use rear focus to get your subject in focus, release it, move the “frame” to achieve desired composition and press the shutter button. After some testing it looks like the VR on a Nikon at least will work now both when I hold the shutter button and when I hold the focus button and as far as I can tell there’s no harm in half-pressing the shutter button when using rear-focus so that shouldn’t be a problem at all. I need to go play with rear focus tomorrow and see how I feel about it! Artie thanks for the info on your new Asus laptop, I bought the same make with more ram and upgraded video card. I gave you credit for this purchase at BH photo. These pictures above are absolutely stunning clarity. I made a mistake in my previous post : it was taken with my 7D. It was taken with both TCs 1,4X and 2X (models III) and a 12 mm adapter between them with a 1DX and the 600 mm model II. This Snowy Owl was quite far away but still you can see some feathers in his face and it was winding a lot! The optics are too good. Enjoy your instructions, Artie. I’m sure they have made me a better bird photographer. Thanks! I have all your APTATS and everything else you have published, and they have been very helpful. One suggestion: while much of your basic instruction will probably never be outdated, the photoshop procedures should be updated to at least CS6 and hopefully CC. It’s now possible to accomplish many of the APTATS procedures with many less steps using the latest version of PS. One question has been bugging me: when you mention that you focus on the “bird’s eye”, for instance, and “recompose”, what actually does this involve. It seems logical that you can’t move the camera off your focal point, so I must assume that you are zooming in or out on the subject when you “recompose”. Am I missing something? As for re-composing, you are simply not understanding the use of rear focus. You push the rear focus button to set focus on the eye, let go of the button, and point the lens where you want to make the best image. The focus does not change because you have let off the button. Please go back and re-read the rear focus tutorials…. her lens choice, etc. are.